First colonised by Spain in 1885, the territory’s sovereignty has been fiercely disputed for decades, particularly since 1975, when Spain officially relinquished its claim over the region. Today it is alternately known as Morocco’s Southern Provinces or the Sahrawi Arab Democratic Republic, however, we’ll be referring to the region as Western Sahara throughout most of this episode. At roughly 260,000 square kilometers or 100,000 square miles, Western Sahara is about the size of the US state of Colorado or just slightly larger than the UK. The territory consists mostly of uninhabitable desert, and nearly 40% of its inhabitants live in Laayoune, the largest city in Western Sahara, while up to 100,000 people from the region are currently living in refugee camps in neighbouring Algeria. This episode, the Finale of Season 3, is our first Patreon-nominated and voted-on episode. Thanks to Erik Tastepe, in particular, for suggesting this interesting location and to all of you who voted. Join us over on www.patreon.com/80dayspodcast to have a say in the direction of future seasons or get access to various awards. In this episode, we carried out an extensive interview with Nick Brooks (@WSaharaProject), a climate scientist, who has worked over many years in Western Sahara, co-directing a project with archaeologist Jo Clarke. This “Western Sahara Project” has led to a recently-published book on the topic (see here). Nick also has a very interesting blog about his time spent there, the politics of the situation and related topics called “Sand and Dust”. Beautiful photo galleries of all the archaeological discoveries from the research project in the desert have been shared on Flickr. Newsweek: WESTERN SAHARA: WHAT IS THE 40-YEAR DISPUTE ALL ABOUT? The music for today’s episode can be found here. In this episode of 80 Days: an exploration podcast, we return to Cuba to bring its story from the Castro Revolution, right up to the modern day. As US-Cuba relations have been in the news this week, it’s impossible to keep up with all the twists and turns, but we do our best. If you haven’t already listened to Part 1 of this episode, we recommend listening to that first to see how we got here. Cuba is an island in the Caribbean Ocean, just 90 miles south of the US state of Florida. Cuba is home to over 11 million inhabitants. Cuba gained independence from Spain in 1902, but soon fell under US influence and became a playground for the rich and powerful; this was particularly true following the 1952 coup that brought Fulgencia Batista to power. Following a turbulent revolution which spanned almost the entire 1950s, the Communist Party of Cuba, under the leadership of Fidel Castro, took control of the country in 1965. Although poverty is widespread, modern Cuba has an outstanding health care and education system and relations with the US are currently beginning to thaw after a protracted embargo that has been in place since the 1960s. Since Cuba has an awful lot of history, particularly in the 20th Century, we decided to split this episode into two parts: this is the second part. Your hosts are Luke Kelly @thelukejkelly in Hong Kong, Mark Boyle @markboyle86 in the UK, Joe Byrne @anbeirneach in Switzerland and – as a new voice for regular listeners – we’re joined in this episode by Erin Barclay in the USA. (Theme music by Thomas O’Boyle). [02:20] Who is Fidel Castro? [64:10] What does the Pope have to do with this? A massive thanks to Andrew Brogan and Crystal, two of the backers of our recent Kickstarter Campaign – thank you for making Season 2 possible. Thanks too to our sponsor Hairy Baby, who in addition to making the funniest Irish-themed t-shirts, have also produced the official 80 Days shirt for our supporters. Find it by clicking here. You can get 10% off anything on www.hairybaby.com by using our promo code “80DAYS”. In this episode of 80 Days: an exploration podcast, we’ll be talking about Cuba, an island in the Caribbean Ocean, just 90 miles south of the US state of Florida. Cuba is home to over 11 million inhabitants, and is the second-largest island in the Caribbean after Hispanola. The country has been subject to numerous territorial disputes and conflicts throughout its long and complex history, but finally emerged into independence in 1902. Following a turbulent revolution which spanned almost the entire 1950s, the Communist Party of Cuba, under the leadership of Fidel Castro, took control of the country in 1965. Although poverty is widespread, modern Cuba has an outstanding health care and education system and relations with the US are currently beginning to thaw after a protracted embargo that has been in place since the 1960s. Since Cuba has an awful lot of history, particularly in the 20th Century, we decided to split this episode into two parts: this is the first part. [53:52] Return of Batista: who needs democracy? Thanks to our sponsor Hairy Baby, who in addition to making the funniest Irish-themed t-shirts, have also produced the official 80 Days shirt for our supporters. Find it by clicking here. You can get 10% off anything on www.hairybaby.com by using our promo code “80DAYS”. In this episode of 80 Days: an exploration podcast, we’ll be talking about Uruguay, a small but prosperous country sandwiched between two massive South American powerhouses, Brazil and Argentina. Widely considered one of the most politically stable and progressive countries in Latin America, Uruguay is home to just over 3.5 Million people and almost ten times as many sheep. By land mass, it is the second-smallest nation in the region. After a four-way struggle between Spain, Portugal, Argentina and Brazil, Uruguay declared its independence in 1825. The country then stabilised until the 1950s, when political turmoil ensued. In more recent years, Uruguay escaped the recession that spread throughout South America in the early 2000s, and has since emerged as a bastion of democracy, progressive policies and free speech. Your hosts are Luke Kelly @thelukejkelly in Hong Kong, Mark Boyle @markboyle86 in the UK, and Joe Byrne @anbeirneach in Switzerland. (Theme music by Thomas O’Boyle). Guillermo Brown and Peter Campbell are the fathers of the Argentinian and Uruguayan navies, respectively – not bad for two Irish lads. Thanks this week to Nick Ison and Eoin Byrne, who backed our Kickstarter campaign. Your t-shirts should be on their way to you already. Thanks to our sponsor Hairy Baby, who in addition to making the funniest Irish-themed t-shirts, have also produced the official 80 Days shirt for our supporters. Find it by clicking here. You can get 10% off anything on www.hairybaby.com by using our promo code “80DAYS”. In this week’s episode of 80 Days, we are talking about Panama, a central American nation most famous its canal that connects the Pacific and Atlantic Oceans. Located strategically on the tiny isthmus between Central and South America, control of this valuable trade route has been competed for by multiple powers throughout its fascinating history. The country is dominated by a central spine of mountains and hills that forms the continental divide. 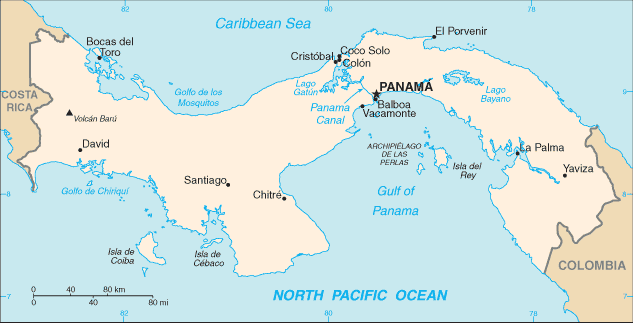 Today, Panama is bordered by Costa Rica to the west, Colombia to the east, the Caribbean to the north and the Pacific Ocean to the south. The capital, Panama City, is home to nearly half of the country’s 3.9 million people. If you’re unfamiliar with the geography, just imagine the two continents of Central and South America hanging onto one another by a thread – Panama is that thread. Please leave us a review on iTunes, connect with us on Facebook or Twitter or drop us an email if there’s anything you’d like to say. Some of the early colonists of significance: Rodrigo de Bastidas, who founded the first European settlement on the American mainland; Vasco Núñez de Balboa, who crossed the isthmus. We mentioned piracy a few times, as in important aspect of trade in the area in the early colonial period. Some well-known pirates who had an impact on Panama were Sir Francis Drake who sacked Nomre de Dios on the Carribean coast of Panama (1572) and the Welsh privateer Captain Henry Morgan who marched across the isthmus and sacked Panama City in 1713. The ruins of the old city are still there and the world remembers Captian Morgan today mostly for the brand of rum named after him! Some of the traditional music used in the episode comes from here.